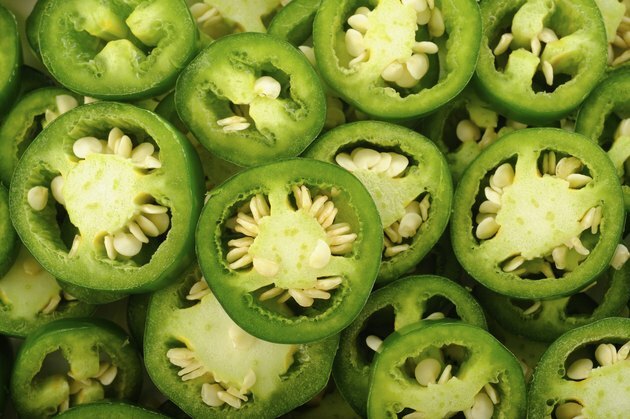 Diced jalapeno peppers add a burst of heat to soups, salads and salsas, but handling this innocent-looking, dark green pepper isn't child's play. Although jalapenos can range in temperature depending on when they're picked, they often contain enough heat in their flesh to severely irritate your skin when you touch them without adequate protection. Jalapeno peppers get their heat from capsaicin, an active chemical prevalent in several varieties of hot peppers. The jalapeno pepper's capsaicin is what causes the pepper to feel hot when it touches your lips, tongue and the inside of your mouth, and it can also irritate your digestive system. This capsaicin burn also affects your hands when you're preparing the peppers and can even cause irritation in your lungs as you inhale the airborne capsaicin. Touching the skin of a jalapeno pepper won't lead to skin irritation, but within minutes of cutting open a jalapeno pepper and having its juice come in contact with your hands, you will begin to experience sensations that range from a minor tingling to a noticeable burning. The pain intensifies as your skin comes in contact with the pepper's juice, white interior membranes and seeds. The irritation on your skin can spread, so avoid touching other parts of your body after handling peppers. Although you might be tempted to rush to the kitchen sink upon realizing that your skin feels as though it's burning, washing your hands with soap and water provides very little relief. Simple home remedies to lessen the pain include thoroughly rubbing your hands with olive oil or milk. The fat in these products helps to disperse the capsaicin on your skin and provide relief. To avoid the risk of lung irritation, prepare your jalapenos peppers in a well-ventilated area. Rather than experience a capsaicin burn and have to spend time lessening the symptoms, it's better to prevent the issue entirely. When you plan to use jalapeno peppers in your cooking, wear vinyl or latex gloves. The tight fit of these gloves won't harm your ability to handle the peppers and your knife, and they allow you to prevent the risk of skin irritation. Remove the gloves carefully and dispose of them when you're done with the peppers. The Washington Post: Should You Wear Gloves When Handling Hot Peppers?